FOR MANY PEOPLE, the current spell of cold weather is, at worst, an inconvenience. But for homeless people living on the streets, it’s much more serious than that. Amid the first cold snap of the year, with temperatures hovering barely above zero and snow falling in many parts of the country, the priority for organisations working with homeless people is to prevent anyone from dying or being seriously harmed by the cold temperatures. 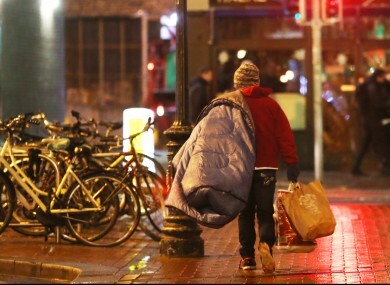 There were 142 people sleeping rough on Dublin’s streets when the last count was carried out in November, which is the second-highest figure in the past decade. The vast majority (85%) were male while 15% were female, the count found. With Met Éireann warning that hail, sleet and snow is expected up until Friday evening, the Dublin Region Homeless Executive, which is the lead body coordinating the response to Dublin’s homelessness problem, has activated a Cold Weather Strategy. The plan will see additional beds provided to the existing number available each night, and an increase in the amount of work done by the main outreach team on the streets in Dublin each night. “During the cold weather period, the team [run by Focus Ireland and the Peter McVerry Trust and funded by the DRHE] will work extra hours, have extra staff and access to additional beds,” said Mike Allen. The team usually works from 9am until midnight every day, but during the cold weather the team is working from 7am until 1am. There will also be a second team out on duty every night while the cold weather lasts. The teams will have a transport service to help people who need to get to where the beds are. NGOs have pledged to make ring-fenced beds available during the cold spell, as part of the 227 beds which have opened up since November. If any families are found sleeping rough – which Focus Ireland said was “unlikely” – they will be provided with hotel accommodation, as part of an agreement between the NGOs involved. There are also special arrangements in place to link in with the gardaí to help anyone in difficulty. The charities are aware that it is very much a short-term solution to a bigger problem, however. Dublin’s homeless charities are asking Dubliners who sees someone sleeping rough to let the outreach team know by filling in the details on the Homeless Dublin website. Email “What's being done to help people sleeping rough cope with this freezing cold weather? ”. Feedback on “What's being done to help people sleeping rough cope with this freezing cold weather? ”.